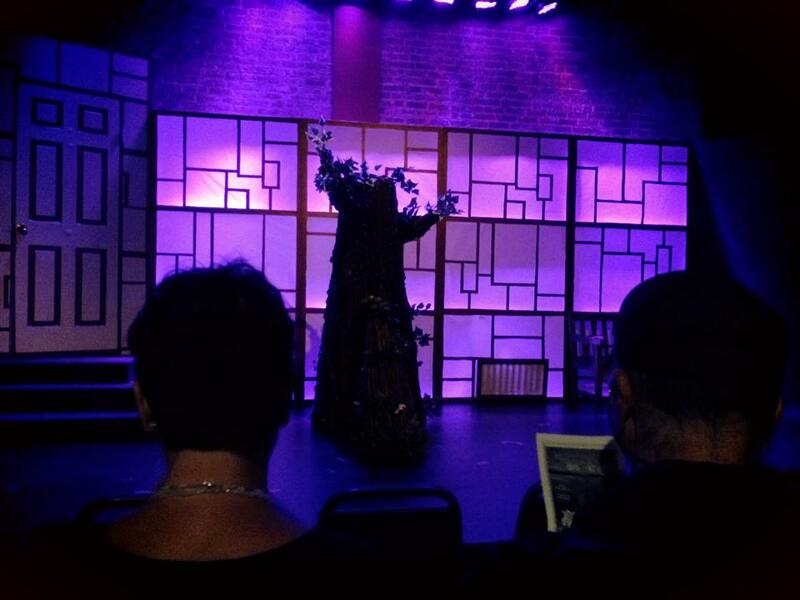 “The Widow West” by Morgan Ludlow is at Stage Werx until September 27, and YOU SHOULD NOT MISS IT! Classical Greece had Homer and Ulysses, ancient Rome had Virgil and Aeneas, and now San Francisco has Morgan Ludlow providing us a myth of the city's own founding husband, Wily West. Historians be damned! 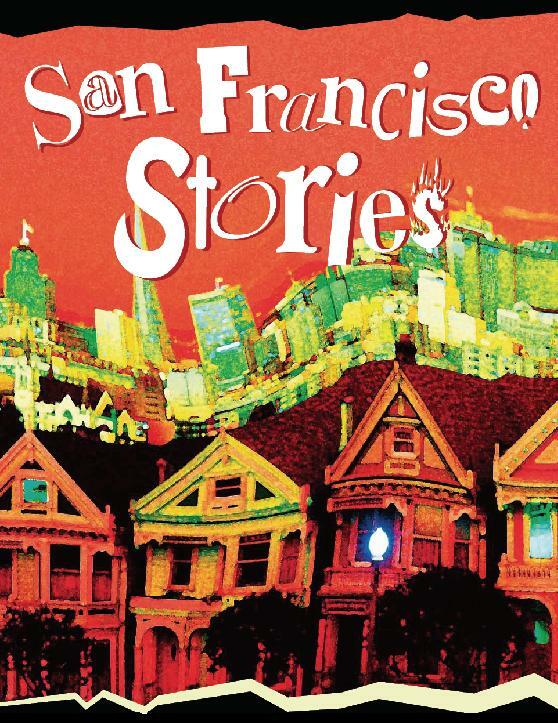 The real story of what kept San Francisco afloat when the gold ran out involves a young cross-dressing prospector by the name of Billy and a rough, tough millionaire, the aforementioned Mr. West. 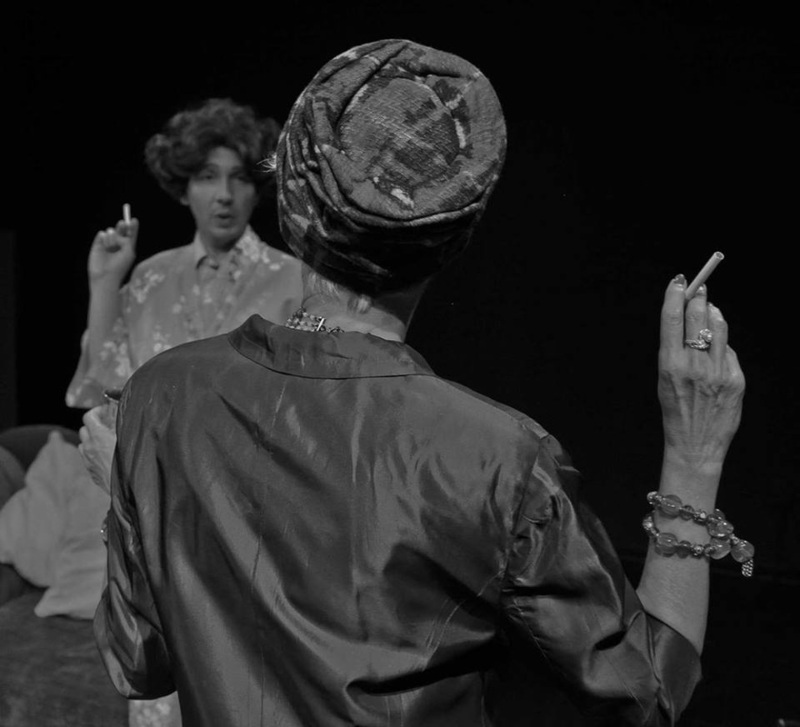 The play is almost too much fun, especially when watching Jason Jeremy as Adolph Sutro vie for the affections of Miss Emma, who he hasn't realized is a young man in drag. 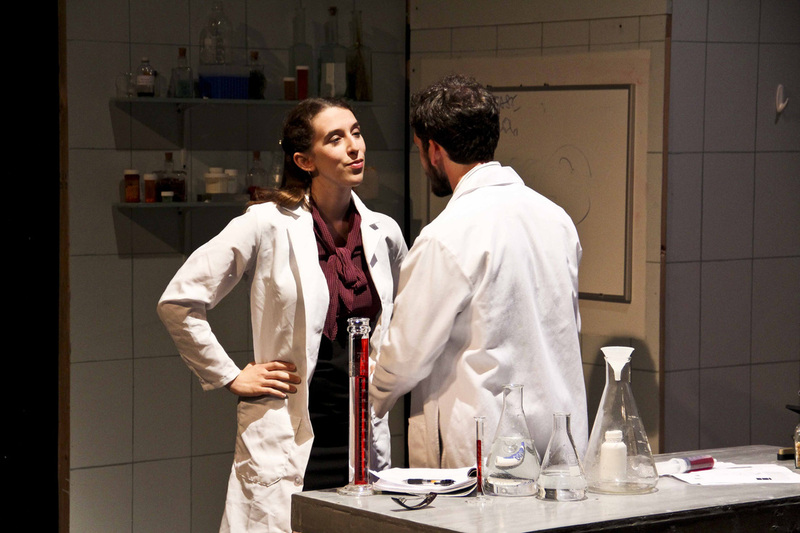 But the underlying humanity of the situation, particularly the danger to Emma if it is ever discovered that she is really a boy, is continually and seamlessly brought back into focus by the playwright and by the cast's balanced work. 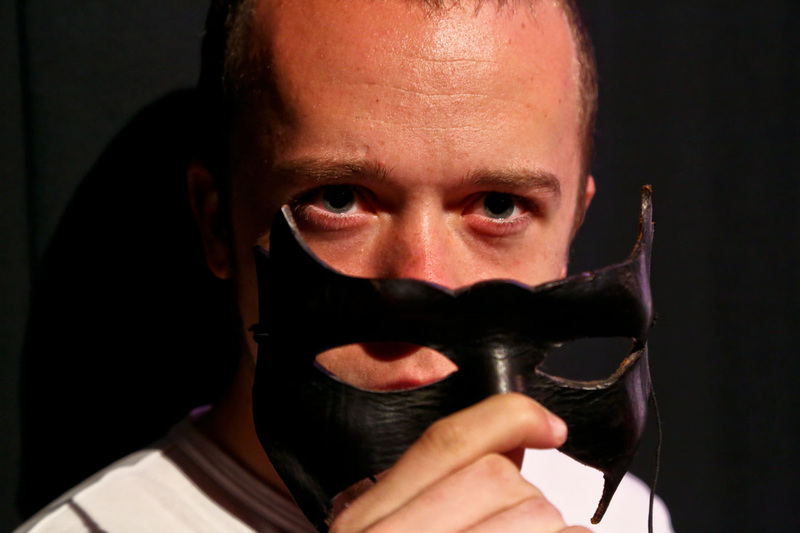 Excellent performances are turned in by Janice Wright as the whore with a heart of coal, Mark Shepard as Sam Brannan, and Billy Hayes as Wiley West. 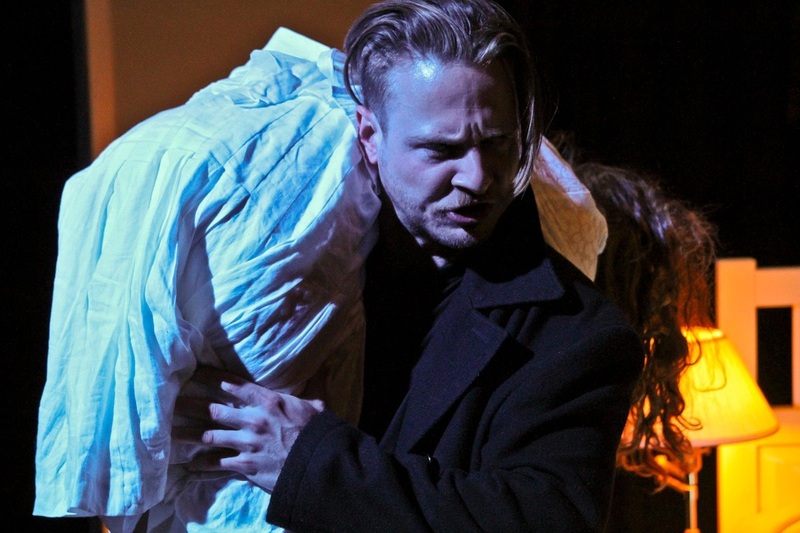 But best of all are the two leads, Nate Levine as Billy and Miss Emma, and Gwyneth Richards as the Widow West, whose narration advances the story. 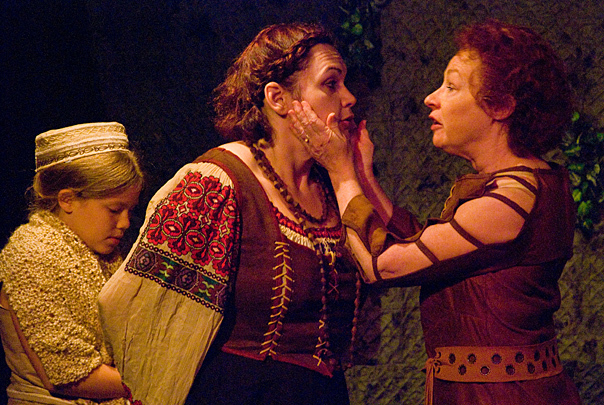 I've been going to theater in the area since 1977 and, for my money, Gwyneth Richards is the Bay Area's most accomplished Shakespearian actor. That's why it was particularly surprising and enjoyable to see her switch from a reminiscing Widow West into brief stints as various comic characters, including a brothel keeper who walks and talks like John Wayne (in a purple gown). As you can tell, I was delighted at this evening of theatre, and I'm urging all my friends to go see it. 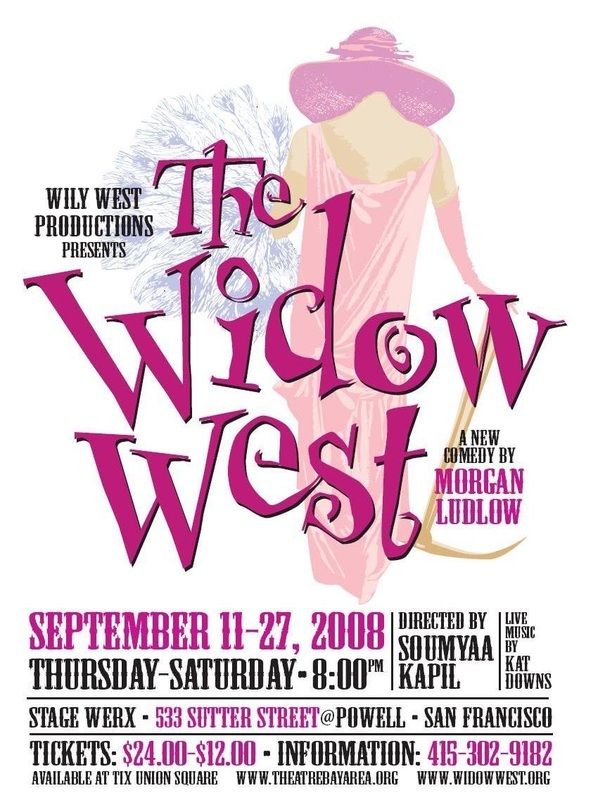 “The Widow West” deserves to be San Francisco’s next big home grown hit. LIVE MUSIC BY KAT DOWNS! 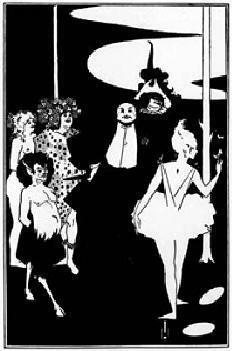 "A new myth for San Francisco"
"An interesting viewpoint of the Christmas spirit with live music (quite wonderful!!!) Excellent acting. Something Christmasy without being Chistmasy." Credit: Michelle Jasso sings as Mona. Jaimelee Roberts, and Garret Dailey. Inside Tower Labs, drug researcher Rocky Wise hopes to create a love vaccine so he never again will feel the pain of a bad break-up. 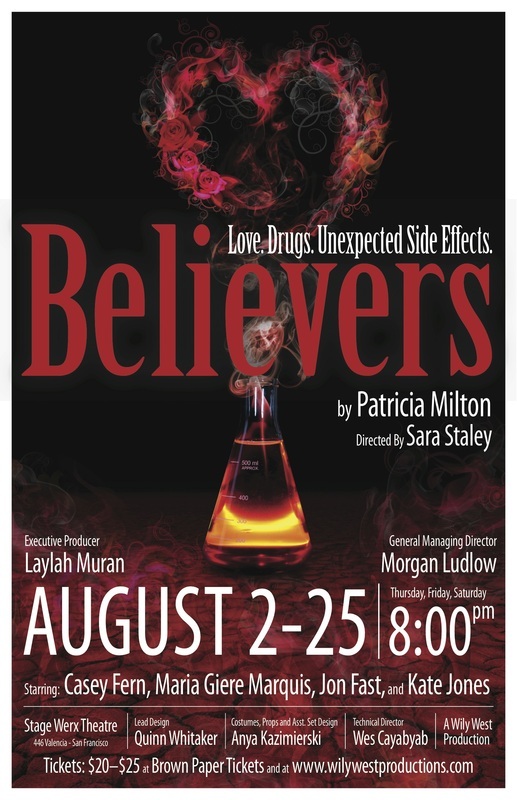 BELIEVERS takes place in a dystopian future at the intersection of pharmaceuticals, religion and romance...delivering a perscription-stength dose of whacked out comedy! Farrah Sanders and Richard Wenzel. 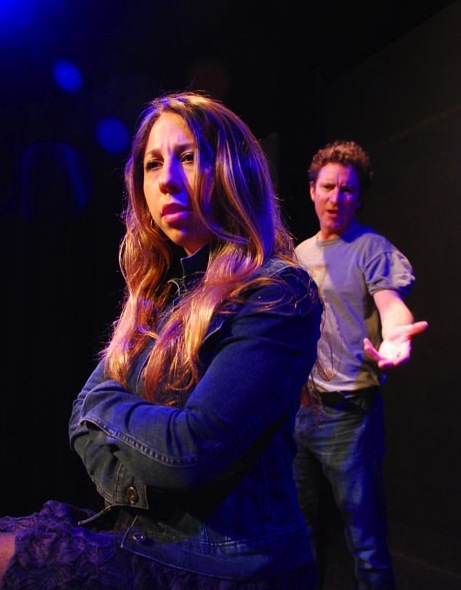 An evening of entertaining and illuminating short plays by local Bay Area writers. 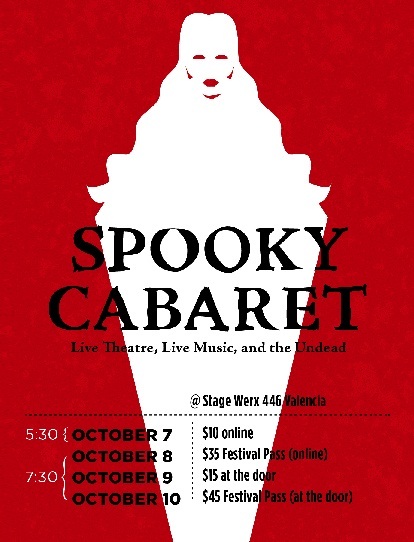 Featuring: Kirsten Broadbear, Kat Bushnell, Bryce Duzan, Travis Howse, Michelle Jasso, and Celeste Russi. 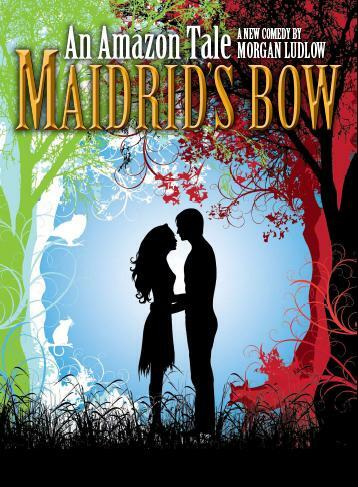 In a beautiful country estate, a mother plans her youngest daughter's wedding while her sister tries to catch the woman she thinks is sleeping with the master. Taking its cue from the novels of Austen, Forster, Waugh and Thackery, JUNO EN VICTORIA is a new British tragicomedy about the secret lives of Victorian women. Funny, sad, and ultimately haunting, this fast-paced, well-researched and meticulously crafted period piece subtly undermines its own source material even as it pays homage to the parlor dramas of a bygone era. Michelle Jasso and Ben Ortega. A brutal and haunting story about friendship and survival during malevolent times. ASHTAD AND DARDANOS parallels the folk story of an unlikely bond between a bear and a squirrel with the setting of a country ravaged by war where two men desperately cling to survival and their difficult relationship with each other. Master and slave. Friends and enemies. Fantasy and reality. 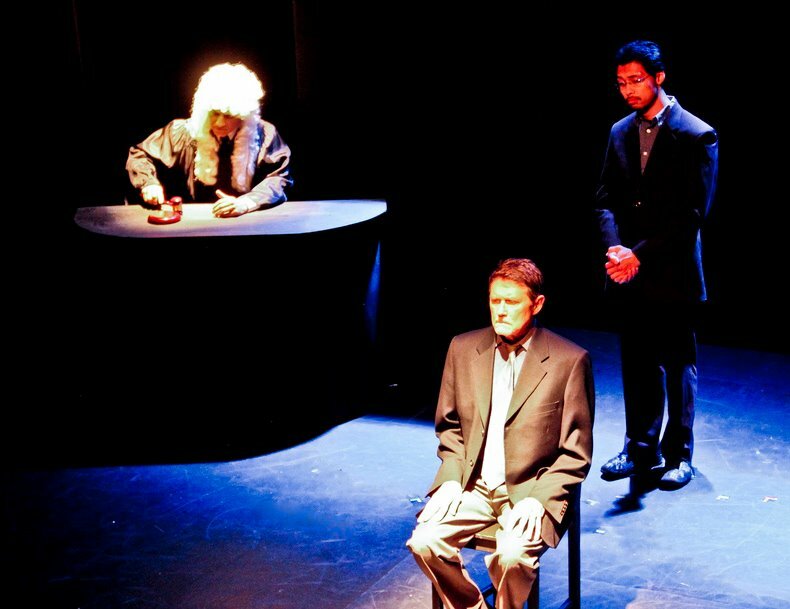 Featuring: Wes Cayabyab, Stephen Chang, Michelle Jasso, Jason Jeremy, Shelley Johnson and Linda Wang. In this hilarious new comedy two would-be couples find themselves stranded in an abandoned cabin, wrestling with trust issues, fears of commitment, and the occasional wayward zombie. 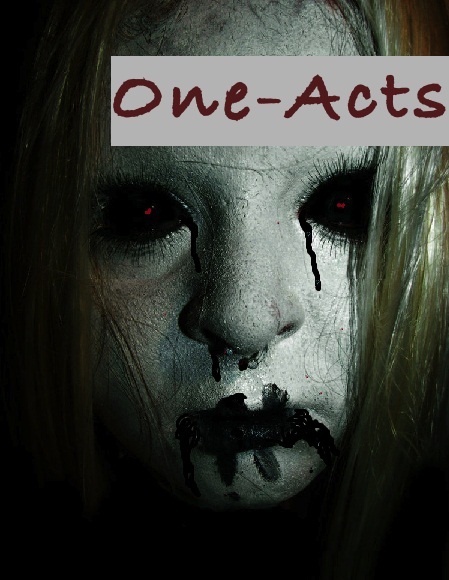 A mysterious woman who is unfazed by the walking dead arrives to claim ownership of the cabin. She has a secret plan of course -- but even she cannot predict what these four people will teach her about the line between death and humanity. "If it is still running, you MUST go see it. The play is SUPERB, the actors are Oscar-worthy. Really." "JUNO EN VICTORIA is a cleverly written and beautifully executed Victorian representation of Ancient Mythology focused on the Goddess Hera and her family." 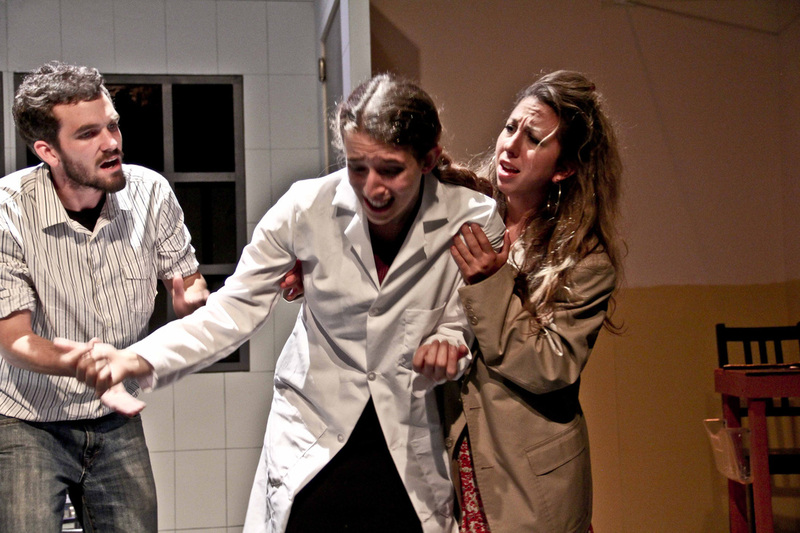 "Bousel's depiction of Hera, and Jasso's realization of it, is a great triumph of the play." "The women in this production are incredibly strong and talented actresses and I was deeply moved..."
An English country estate in the high Victorian era, the Goddesses Hera and Hestia are a pair of wealthy sisters semi-retired to pastoral bliss and boredom. 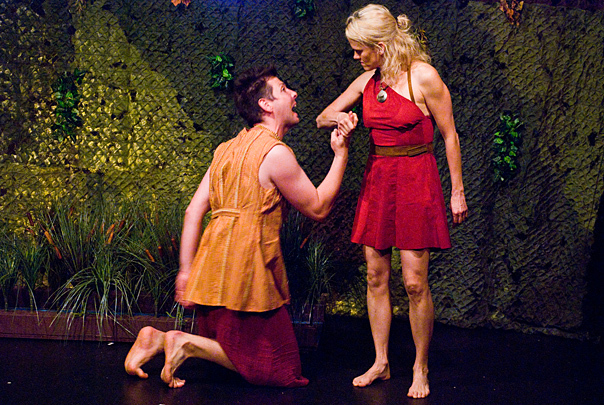 The story revolves around the imminent marriage of Hebe, daughter of Zeus and Hera, to Heracles. Taking its cue from the novels of Austen, Forster, Waugh and Thackeray, JUNO EN VICTORIA is a new tragicomedy about the secret lives of Victorian women. Funny, sad, and ultimately haunting this period piece pays homage to the parlor dramas of a bygone era. 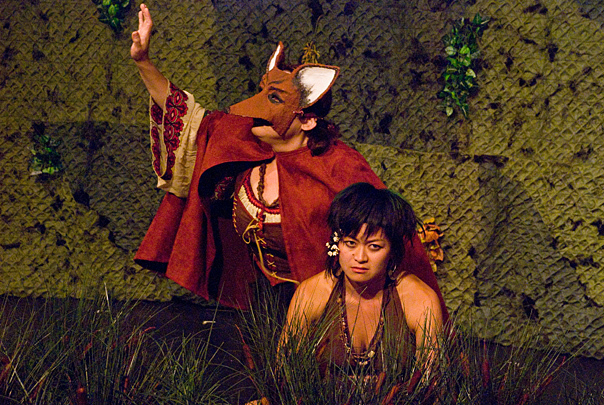 and Michelle Jasso as Hera. The funniest play this season!" 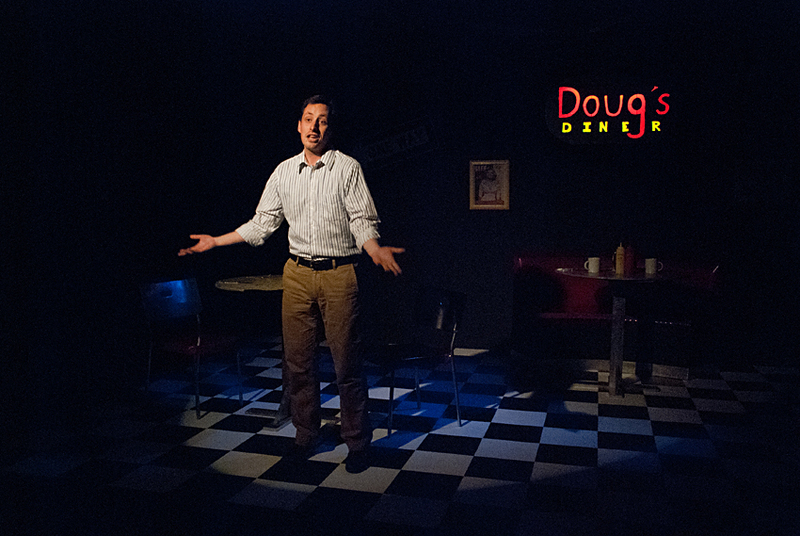 In this delightful comedy Norman is in the men’s room, struggling with the lessons from his time management class, Peaches is waitressing at Doug’s Diner, struggling with her gas price theories, and Joanne is in the Chinese laundry, struggling with her flow charts. They all meet at Doug’s Diner and find their angst-ridden lives turned upside down when straight-talking Syd sits down at their table. Love blossoms. Happiness reigns. But the happiness may be short lived, as Norman’s time management skills are challenged by the ultimate nemesis of time management, a baby! but with a post-modern twist!" 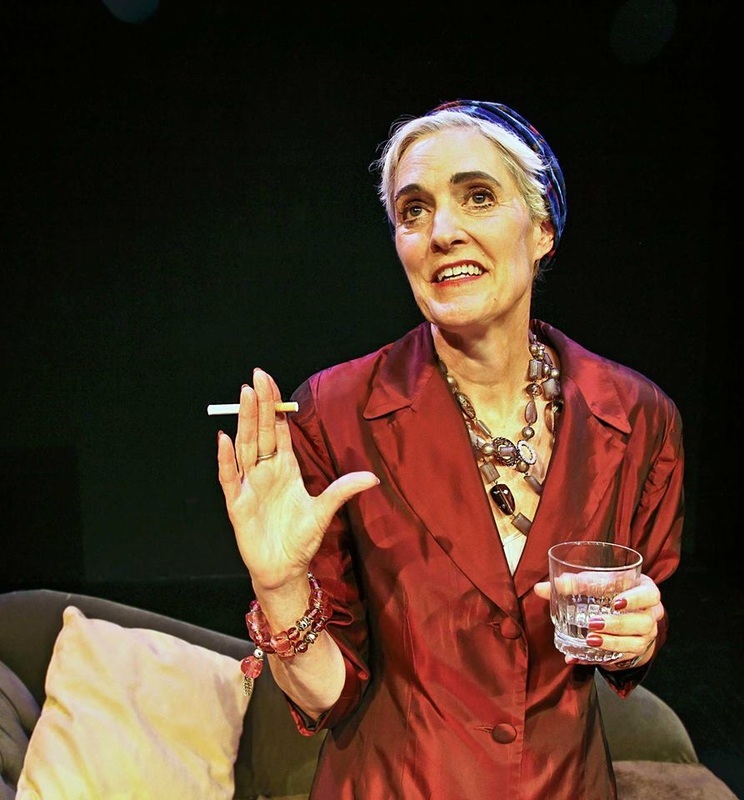 "Stuffed with ultimatums and revelations and Jewish-Italian home cooking..."
"We all left with huge smiles and repeating great lines from the show! Another Wily West cavalcade of talent showcasing beautiful work from all ends." "A wild and melodramatic send-up of the mafia genre." 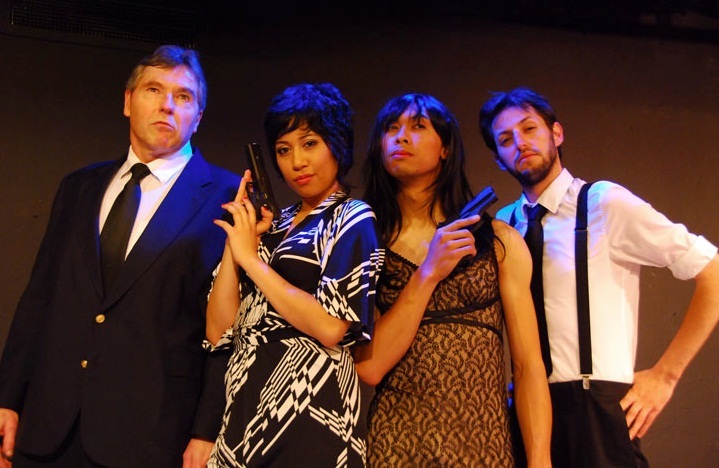 The Godfather meets Trannyshack in this hilarious transgender mafia story. When mafioso boss, Alfredo Reggiano, is invited to dinner by his competitor and rival, Roma Asiago, to talk "business" Alfredo knows he should be prepared for anything. 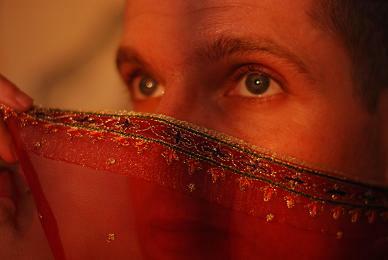 But nothing has prepared him for the shock he is about to face when Roma reveals her ultimate reason for meeting him. 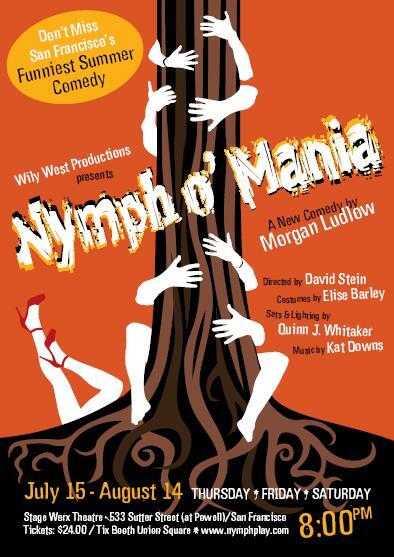 From the same creative team that brought you the critically acclaimed hit show, Nymph O' Mania, last summer comes this new outrageous comedy! Hell hath no furry like the women Frank left behind in AFTER FRANK . Fleeting fame and scientific ambition affect a young romance in CURT AND LAURA: A STORY OF LOVE AND BIG NUMBERS and the missed chance to ride a heroic-win on the basketball-court out of small town poverty twenty years ago brings old friends to the Stinky Raccoon Saloon in TWO TO FIVE WITH THREE SECONDS TO GO. In AUTO-INCORRECT Nate doesn't have a chance with old high school crush Claire, an enthusiastic English teacher, when his brain starts "correcting" his speech on their first date, but an unexpected similar interest bring two opposites together at the tattoo parlor in INDELIBLE. W hen the line between art and life blur too close for her soon-to-be son-in-law's comfort and daughter Midge sees the line, Madeline finds it hard to hide in CHRYSOMELIDAE HIDE NO MORE. Athletic and tough Mei-Hua never did SAY UNCLEand she never will. And while Maddy and Joe potentially ruin their daughter's birthday and try to unravel the blame in PINATA FIGHT , the star crossed dog and cat, ROMULUS AND JEWEL experience an instant and tragic inter-species passion surpassed by no-one except perhaps their masters' ill-fated love at first sight. 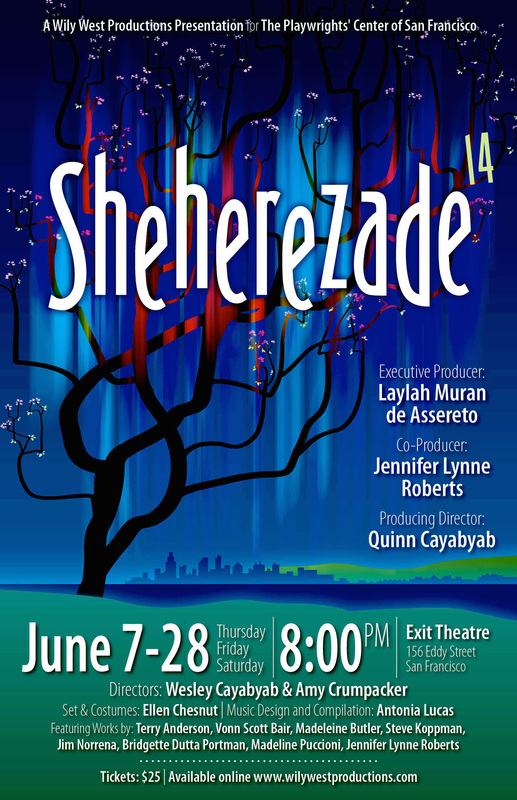 Now in its 13th year, Sheherezade throws down the gauntlet! 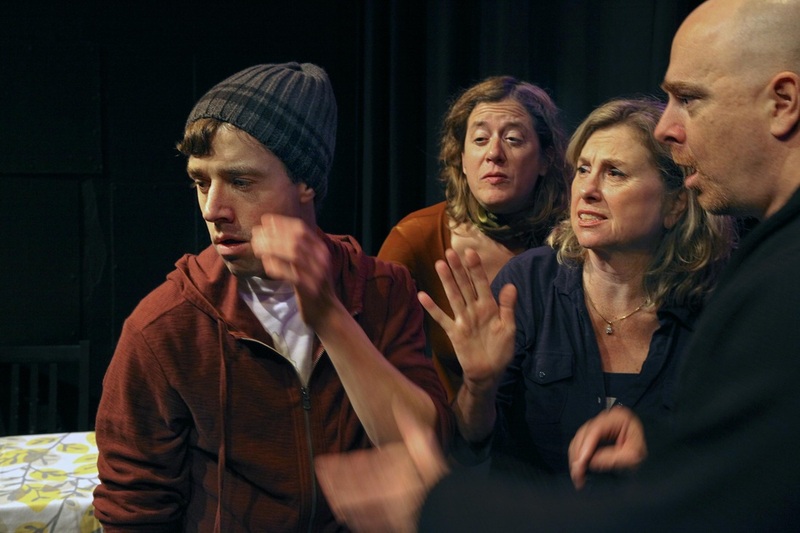 It's an evening of fully-produced short plays by Playwright's Center of San Francisco members performed by a phenomenal ensemble cast. Always a mix of the irreverent with the poignant, this year's line-up promises to be fun, entertaining, intelligent and occasionally quirky. All photos by Jim Norrena. This show brings the iconic star back to life for some drinks and lively conversation. When an ambitious young journalist sneaks into Joan Crawford's Beverly Hills Hotel suite, he thinks he is about to get the interview of his career. But the aging movie star has something else in mind. 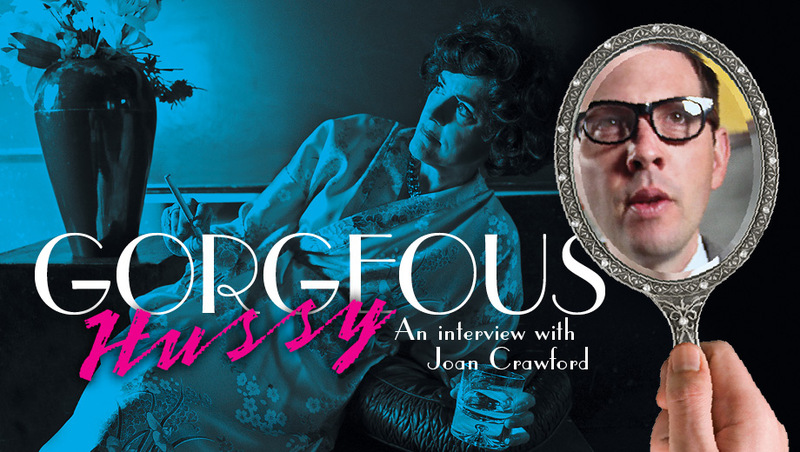 In a strange twist of vodka and make-up, the tables are turned and the interviewer becomes Joan Crawford while the woman behind the icon asks the really hard questions as she struggles to understand the truth behind her career and life. 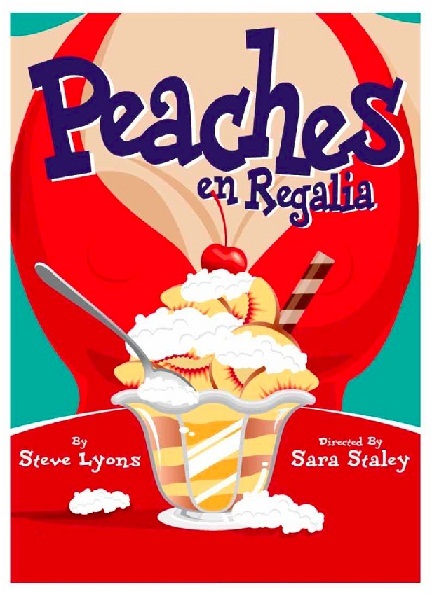 This play by Morgan Ludlow will be directed by Brady Brophy-Hilton and will feature the amazing talents of Susan Jackson and Ryan Hayes two local actors you will not want to miss giving a tour de force performance! 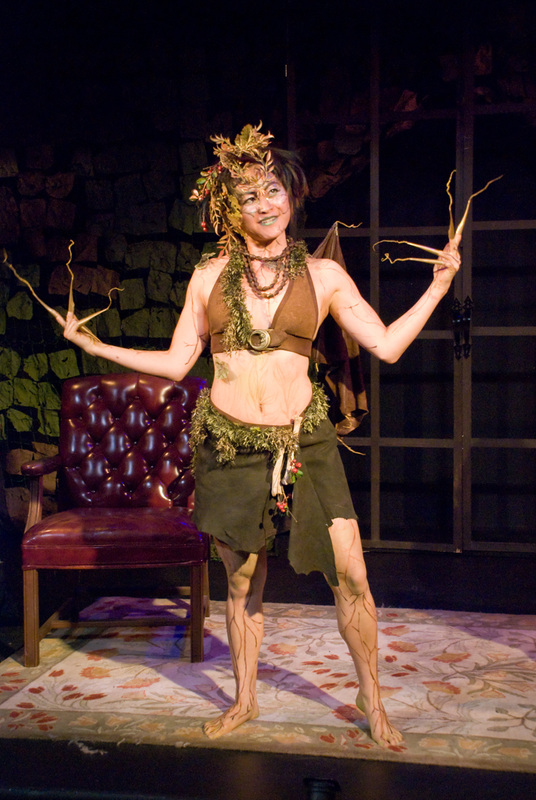 Gorgeous Hussy will run July 26, Aug 1, 3, 9, 15, 16 @ 8:00pm. 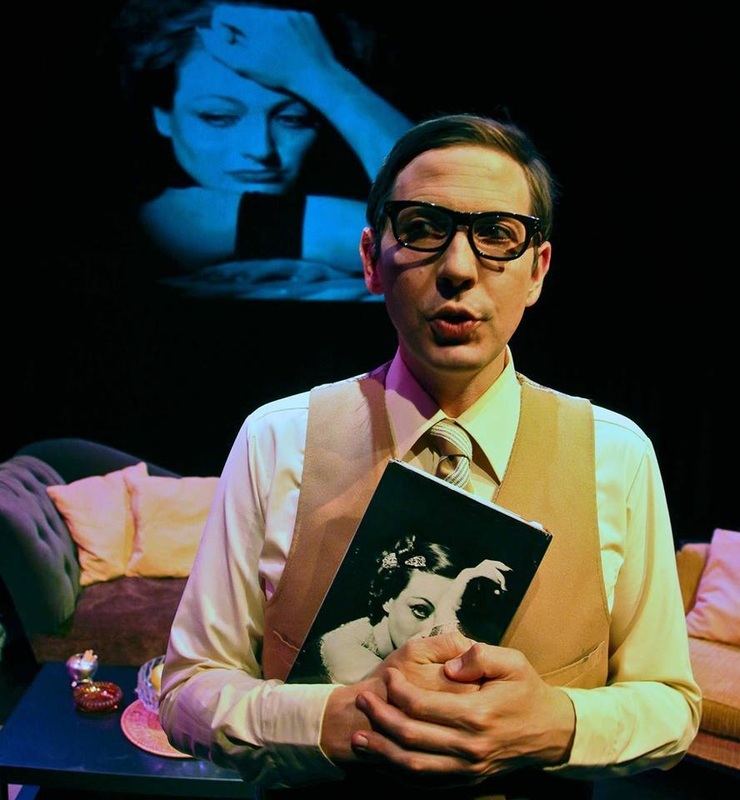 "Fans of Joan Crawford will find delight with Morgan Ludlow’s new two-hander. As the elderly movie star, Susan Jackson gives a fine impersonation, convincing us that we are in the presence of cinematic royalty. 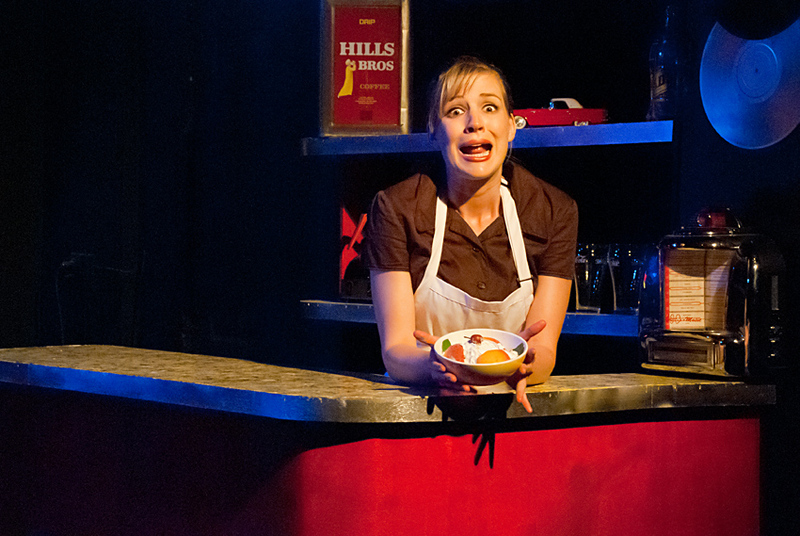 As her interviewer, Ryan Hayes gives a performance that is full of unexpected twists and surprises." "It was a wonderful way to explore the lesser known Joan Crawford, the woman behind the public figure, the possible motivations behind her sometimes questionable parenting skills and behavior...this was executed with humor as well as compassion, bringing tears to my eyes at times, between the laughter." 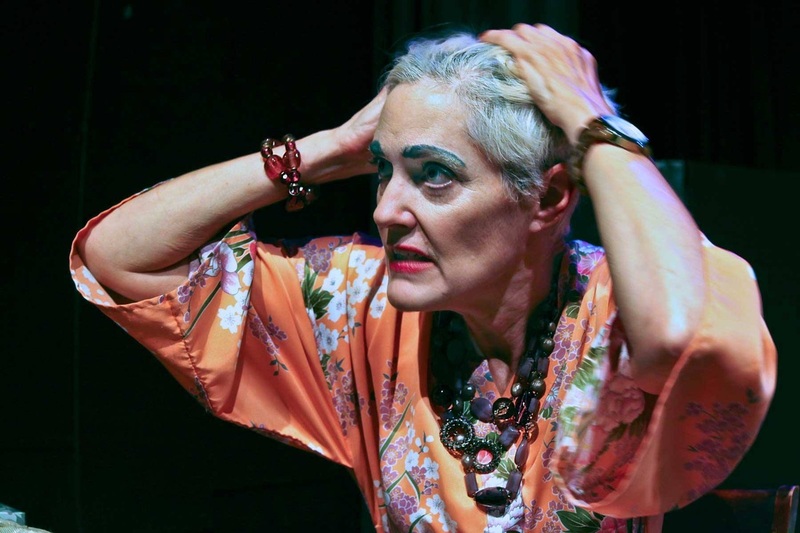 "Susan Jackson and Ryan Hayes deliver compelling portrayals of Joan Crawford (with or without her wig). But what Gorgeous Hussy really achieves is a clinical dissection of the perverse power of celebrity and the dangers of trying to live up to one's publicity." 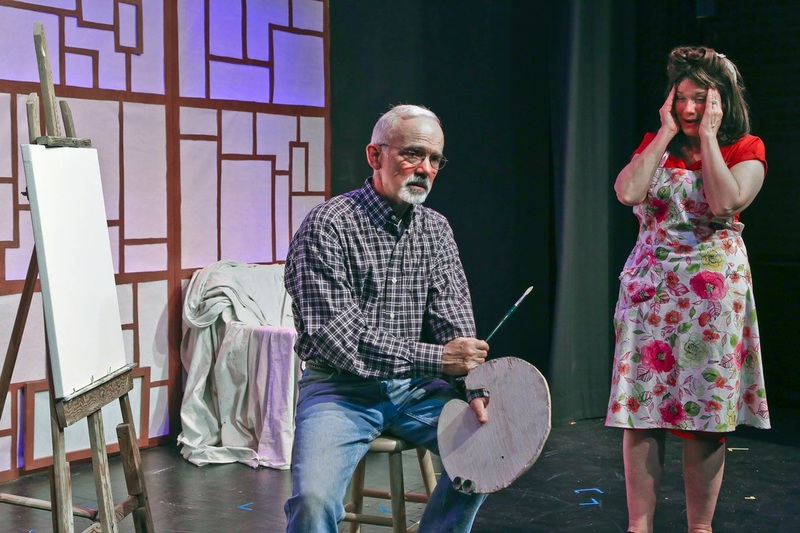 "The playwright certainly has fun with many of the cliches of the genre: the isolated country inn, the stormy weather, a ghostly child in need, a mysterious landlady, a cantankerous old codger with a desperate secret, and so on and so forth. He also manages to imbue his hapless haunted couple with an interesting personal subtext that helps us to care about them in their life predicament, bringing a bit of gravitas to an otherwise lightweight story.The result is entertaining"
Lawfully Wedded is a timely collage of scenes and stories that reveal the American struggle for marriage equality. 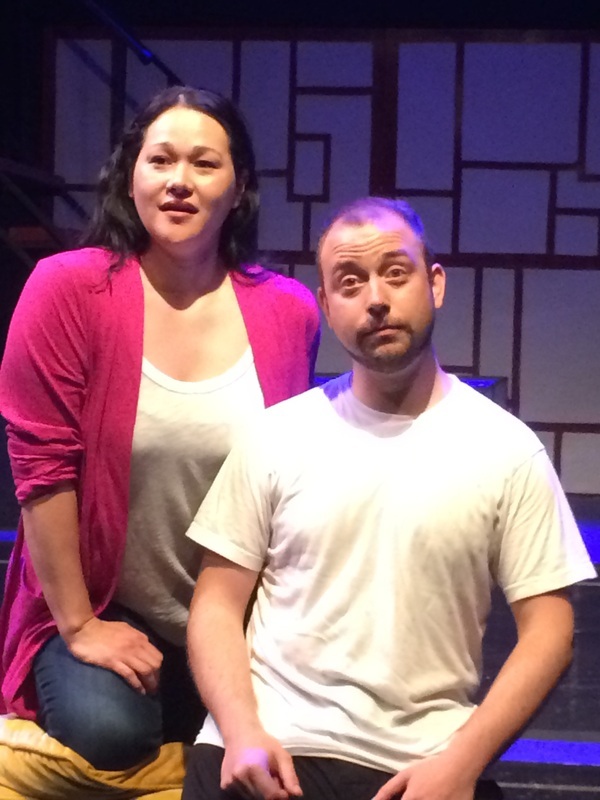 The show is written by three San Francisco playwrights: Morgan Ludlow, Kirk Shimano & Alina Trowbridge. When Bill and Jason decide to get married, they confront all the familiar challenges any newlywed couple must face as they plan a wedding, meet their in-laws, buy a house, mix with the neighbors, have a child and deal with the calamity of a major illness. 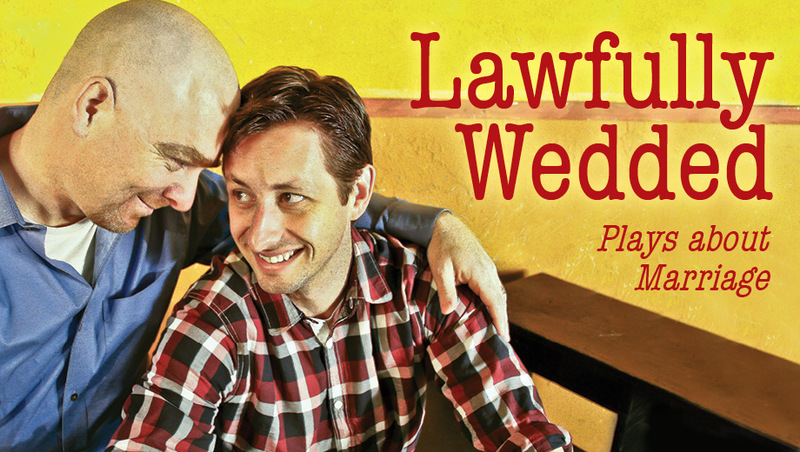 Lawfully Wedded will run July 25, 27 Aug 2, 8, 10, 17 @ 8:00pm. 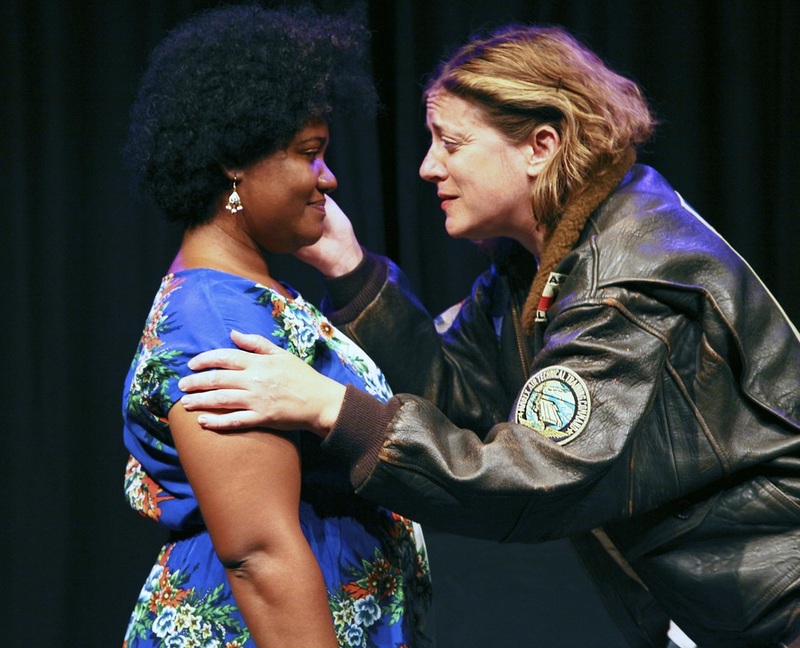 "LAWFULLY WEDDED offers a pleasant night at the theatre overall, with some surprisingly effective moments, excellent writing and fine acting." While spending the weekend at a secluded bed and breakfast, Stan and Angela awake to screams in the night. Unable to leave until the mystery is solved, Stan and Angela struggle to separate what is real from what is imagined, and they soon realize the answers to those questions are literally a matter of life or death. Theirs! 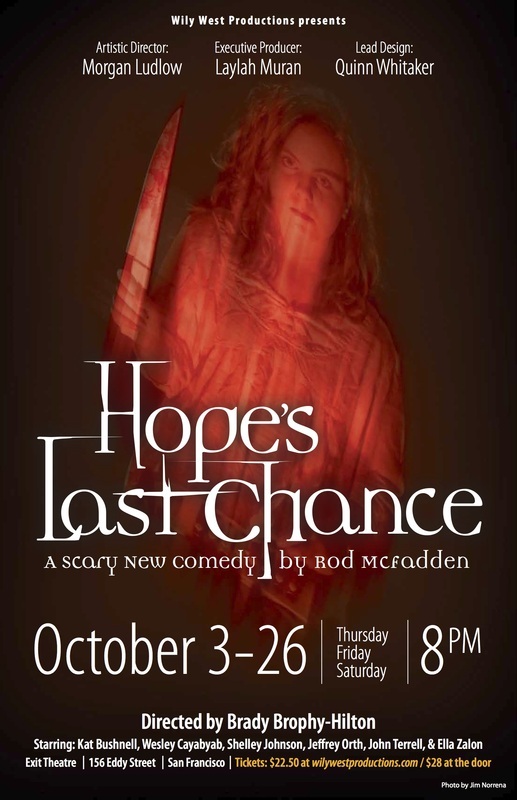 HOPE'S LAST CHANCE combines elements of the classic murder mystery and romantic comedy, into a hilarious and chilling new ghost story that will keep you guessing (and laughing) until the very end. Jenna May Cass & Dan Wilson. Photo by ML. "Are you the kind of person who questions authority? Who likes to challenge the status quo or disrupt established business models? 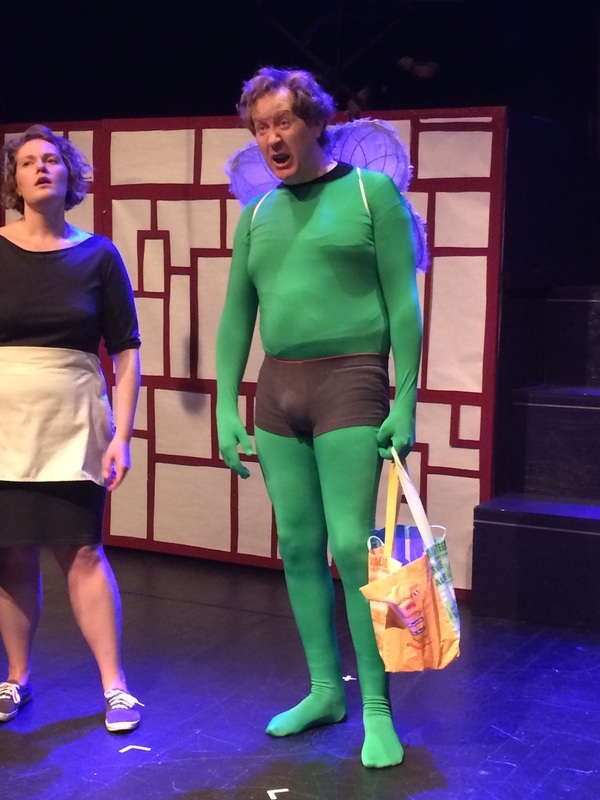 If so, you'll probably be amused by the mini-dramas included in Wily West Productions' Superheroes..."
"A fun play, with some decent acting and writing. We had a very enjoyable night." 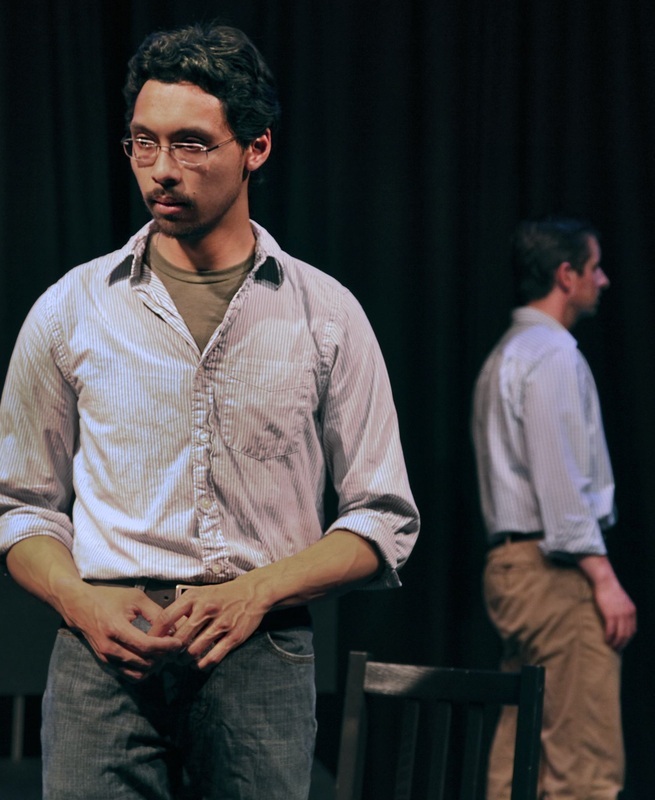 "The plays are all clever, occasionally touching, and divergent enough to sustain interest. The ensemble is first rate and is more-than-ably supported by musician Kat Downs who has composed several clever original songs and incidental music which she performs with panache." 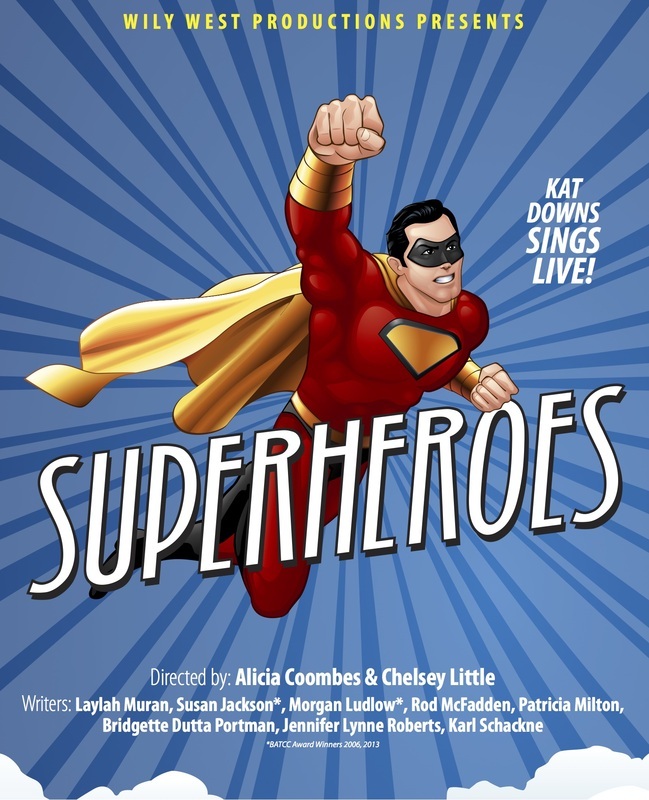 Superheroes is a tight, hilarious collection of interwoven stories about old and new superheroes – their woes, predicaments and foes resulting in a funny and powerful new show that will be performed by an ensemble cast. What happens at the Superhero Convention? What do Superman and Wonder Woman talk about when they are drinking whiskey? And what tricks does Angry Fairy Boy have in store for us this time? Kat Downs, from the band Sit Kitty Sit, will be returning to Wily West and singing live each night songs written from the theme. Karen Offereins & Brian Flegel. Photo by ML. Shelley Lynn Johnson. Photo by Jim Norrena. "In a story that at first seems to have a gay relationship at its core before sending out tendrils into complex webs of sexual permutations. Happy and sad are always in close proximity, but Bousel finds ways to evoke laughs that always seem appropriate for the situations. Even the most quippish wisecracks ring true for the characters, who feel like fresh creations but are somehow still familiar." "Stuart Bousel has written a very clever entertainment and this production has a young energetic cast performing the roles." "Delightful. The cast is uniformly excellent...the direction is sharp and smooth, and the script is hilarious (and incisive). 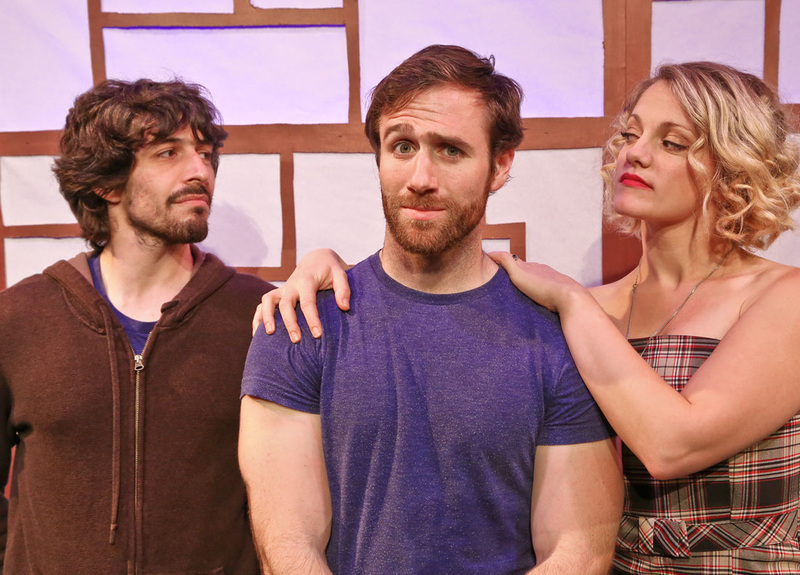 A comedy with a great deal of heart, this one is for anyone who has ever dated. I'm not kidding. The questions we all have while in the dating pool are deliciously exposed and up-ended in this tale of a love triangle that becomes a rectangle and then a hexagon... I'm going to go back and see it again." 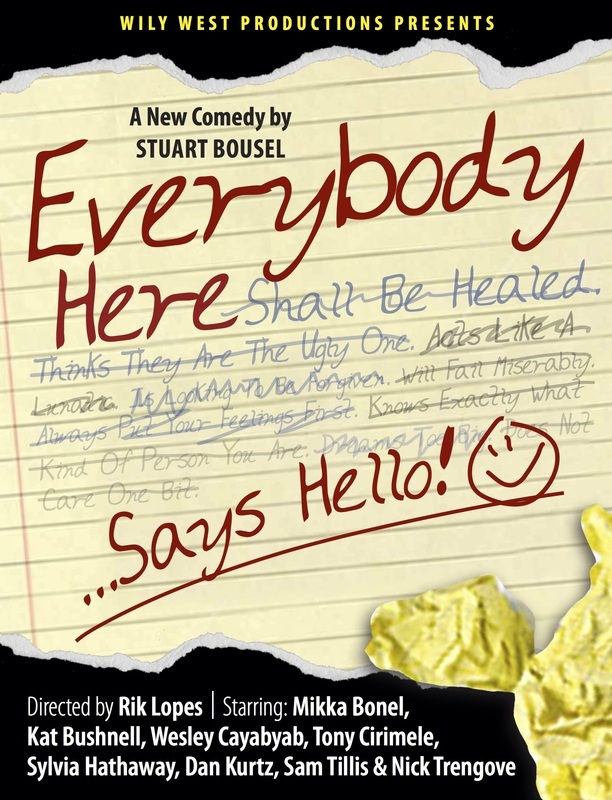 A fast-paced comedy about a man, his boyfriend, and his boyfriend's girlfriend, Everybody Here Says Hello! is a bittersweet exploration of the ups and downs inherent to modern relationships and sexuality, the absurd distortion of our lives when seen through the eyes of our friends, and all the things we want to say to one another but never do. Dan Kurtz, Nick Trengove, Mikka Bonel. in EVERYBODY HERE SAYS HELLO! 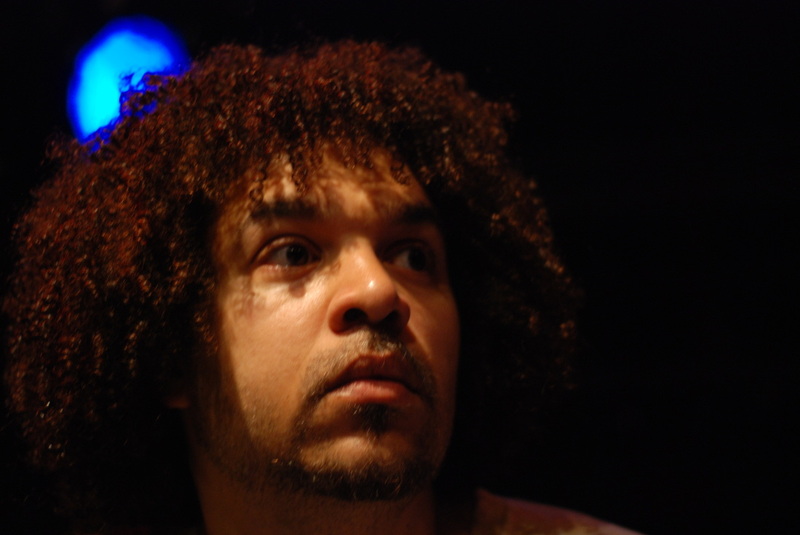 Photo by Jim Norrena.